Control fungal diseases and insects on your fruit, nut, or citrus plants with this Bonide Citrus, Fruit, and Nut Orchard Spray Concentrate. This concentrated liquid handily helps eradicate insect pests like aphids and scale, as well as fungal ailments like powdery mildew and leaf spot. The formula is effective on many types of fruit, nut, and citrus plants, as well as lawns, ornamentals, and houseplants, and can even be applied up to the day before harvest. 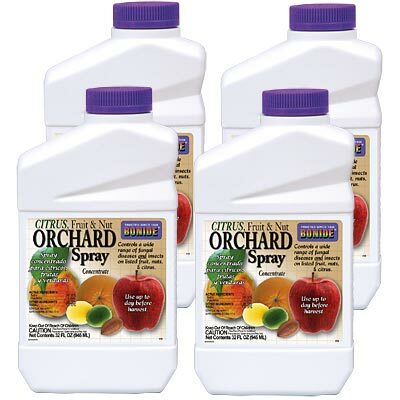 Dilute this concentrate with water and apply it throughout your orchard with a garden sprayer, ensuring new shoots and leaves are covered for full and lasting control. This spray can be used every 7 to 10 days as needed on your roses, walnut trees, citrus trees, or corn for a wonderful harvest. Help your trees remain free of diseases with this Citrus, Fruit, and Nut Orchard Spray Concentrate. Made in the USA. Note: This case pack includes 4 bottles of Bonide Citrus, Fruit, and Nut Orchard Spray Concentrate.